Mansfield Town boss David Flitcroft believes academy graduate Alistair Smith has plenty more room for development. Flitcroft praised the midfielder’s progress to date after he signed a new 18-month deal with the club. 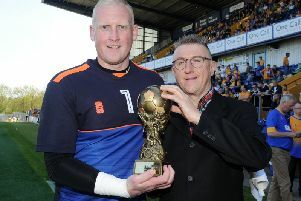 “The credit for Alistair’s progression goes to the academy staff, with the relationship they have with him and the trust he has in them,” said Stags’ manager David Flitcroft. Following his schooling at the Stags’ acclaimed academy, the midfielder was first selected for the first team matchday squad in Mansfield’s clash against Cheltenham earlier this season. The skilful midfielder enjoyed a brilliant tenure with the club’s U18s – winning back-to-back EFL Youth Alliance titles under academy manager John Dempster - and was a regular starter on loan for Loughborough Dynamo last season. The 19-year-old enjoyed a loan spell with Frickley Athletic earlier this season and after his recall, made his first team debut in November in the Stags’ 3-2 victory over Scunthorpe United in the Checkatrade Trophy.